Web application firewalls (WAFs) are a type of intrusion detection and prevention system and might be either a hardware or software solution. It is specifically designed to inspect HTTP(s) and analyse the GET and POST requests using the appalling detection logic explained below. Web application firewall software is generally available as a web server plugin. WAF has become extremely popular and various companies offer a variety of solutions in different price categories, from small businesses to large corporations. Modern WAF is popular because it has a wide range of covered tasks, so web application developers can rely on it for various security issues, but with the assumption that this solution cannot guarantee absolute protection. 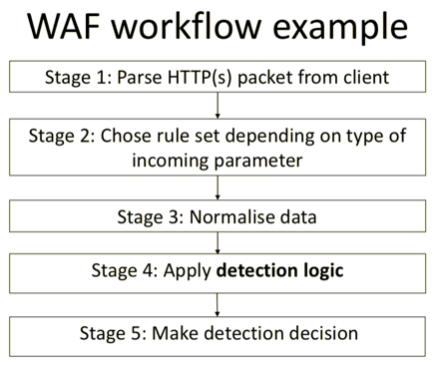 A basic WAF workflow is shown below. 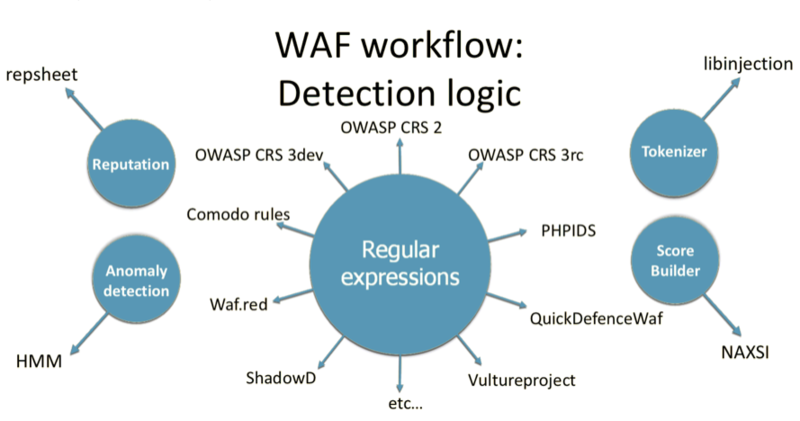 Its main function is the detection and blocking of queries in which, according to WAF analysis, there are some anomalies, or an attacking vector is traced. Such an analysis should not make it difficult for legitimate users to interact with a web application, but, at the same time, it must accurately and timely detect any attempted attack. In order to implement this functionality, WAF developers usually use regular expressions, tokens, behavioural analysis, reputation analysis and machine learning, and, often, all these technologies are used together. 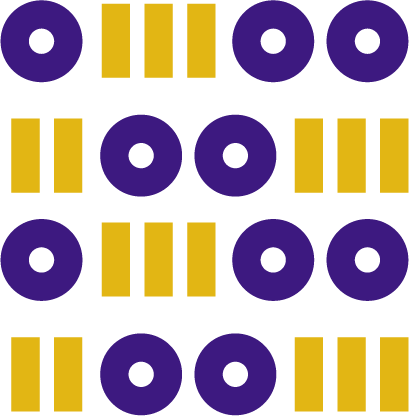 In addition, WAF can also provide other functionality: protection from DDoS, blocking of IP-addresses of attackers, tracking of suspicious IP-addresses, adding an HTTP-only flag to the cookie, or adding the functionality of CSRF-tokens. Each WAF is individual and has a unique internal arrangement, but there are some typical methods used for analysis. Last year 2018, a theatre production series called Tale of the Century was launched in Estonia. Throughout the year, 22 local theatres presented their interpretations of the past hundred years of Estonian history to the audiences. In the draw, the Russian Theatre was assigned the topic of the future of Estonia.